Need your fascias or soffits cleaned? Blue Sky Guttering Ltd will clean your soffits and fascias to the highest standard possible - enforced by our unique 12 month guarantee. Our team take the expertise and knowledge of gutter cleaning and clean the whole fascia and soffit area of your roof. The cleaning work is always finished to the highest possible standard - Get your free fascia, soffit & gutter quote now! Specialists in residential fascia, soffit cleaning Birmingham. Fascia and Soffit Cleaning by Blue Sky Guttering in Birmingham really helps to Improve the look of your UPVC Fascia and Soffits. Regular cleaning reduces the build up of dirt and so at Blue Sky we take pride in making sure you get the best posiible clean. We can clean UPVC and other materials to the highest standard possible. Blue Sky in Birmingham are reliable and professional at all times and therefore make ideal candidates for your Landlord/Housing Association cleaning projects. We will organise the cleaning programme for the whole year and keep you updated at all times. We operate our fascia & soffit cleaning service throughout Birmingham. Fascia & soffit cleaning helps avoid costly repairs and damage to your roof. FFascia & soffit cleaning systems should be ideally thoroughly cleaned twice a year. 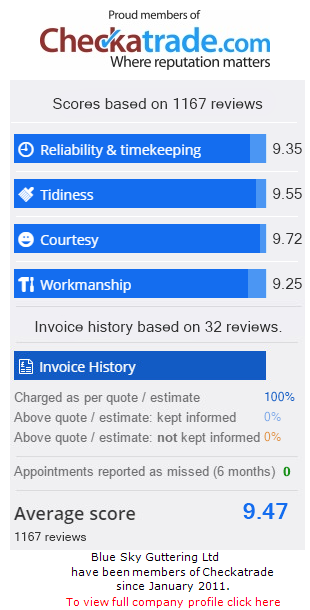 We will ensure all our prices are competitive and you receive the highest standards for your fascia, soffit & cleaning cleaning in all areas of Birmingham and the South East. Leaking gutters or water overflowing from blocked gutters can run down walls causing damp in the building. From the information you supply we can give our customers an instant and accurate fixed price for fascia, soffit & gutter cleaning by email. Our charges are very competitive and offer superb value for money. The price you are quoted is the price you will pay as there are no other hidden charges. that enable the Blue Sky Guttering teams to complete 99.9% of all residential gutter repairs and fascia & soffit cleaning with one visit. Residential customers in Birmingham contacting Blue Sky Guttering for a quotation will be given an all inclusive fixed price either by phone or email. We visit all Commercial customers and residential customers in Birmingham with large properties or an unusual access problem, quotation will then be emailed within 24 hours. that enable the Blue Sky Guttering Birmimgham teams to complete 99.9% of all residential gutter repairs and gutter emptying with one visit.